For six days only — March 25-30 — what promises to be an extraordinary exhibition will fill the Wade Thompson Drill Hall at the Park Avenue Armory. 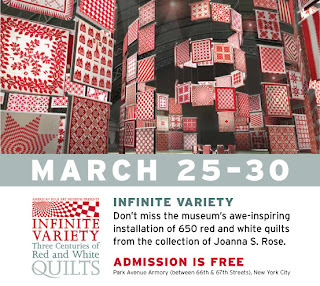 “Infinite Variety: Three Centuries of Red and White Quilts,” which was organized by the American Folk Art Museum, will present 650 red and white quilts — no two of which are alike — from the collection of Joanna S. Rose (who will donate 50 of them to the museum when the exhibition ends). The largest quilt exhibition ever mounted under one roof in New York City, it will fill the 55,000- square-foot drill hall to a height of 45 feet with a series of “rooms” defined by quilts that will be suspended on cardboard tubes. Read the entire article here. 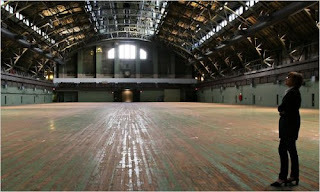 This is a picture of the Park Avenue Armory before it will be transformed into the artist rendering as shown above. New York quilt collector Joanna Rose received her first quilt, a red and white blanket with a schoolhouse design, upon the birth of her first child in 1957. She hasn’t stopped collecting since and has amassed more than 1,300 quilts. 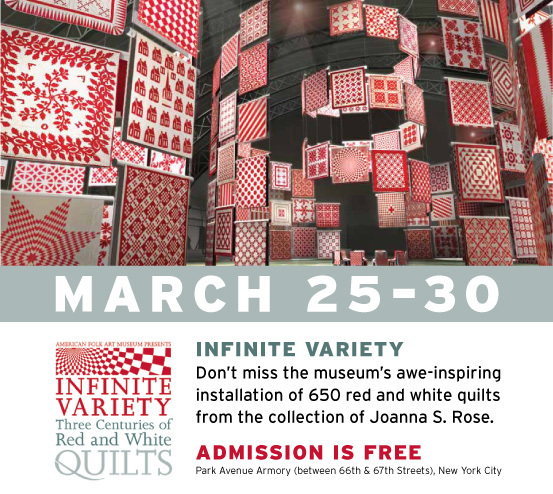 When Ms. Rose, who belongs to a prominent New York real-estate family, recently turned 80, she decided to put her entire collection of red and white quilts—some 651—on public display. Can you imagine 650 red and white quilts and no two are alike? Three centuries of red and white quilts from one single collection owned by Joanna S. Rose. Quilts in the New York Times and the Wall Street Journal, they must have learned what we knew all along that cotton is a commodity and highly sought after whether as a crop or a cover. What a great visual…. Can you imagine the “ballers” and the “quilters?” Wouldn’t that be funny to see balllers aggressively grabbing after a me and my sister Christmas fat quarter bundle? I wonder how these guys would fare at Quilt Market’s sample spree because I have seen some quilter’s going after IT just like this. I will be at the show on the 30th. Hope to see you there. OMG Jealous! Have fun and report back for those of us who can't go. enjoy!!! i'm trying to take a day off from work so i can drive up & see the show. The Final Four and Opening Day at Yankee Stadium with the Yanks going against the Tigers. I believe just about everyone will be in NYC! If the quilts are just half as impressive as they are in the mock-up on the advertisement – they will be stunning. Wow…have fun! I know you'll bring back photos to share…can't wait to see them! The advertisement is enough to make anyone want to see this show! Love the photo with the basketball players and the FQ bundle, too! I'm counting the days until quilt market…absolutely can't wait to be there! That show sounds fantastic! That'd be a long drive from Kansas though. Hopefully you'll share some pics. Oh, and i just have to say…Go Jayhawks! Hopefully they'll be there. Can't wait to see pictures of this. It sounds amazing! I don't think the basketball players would do well at a sample spree. You gotta be quick and low to the ground. They're too tall for the short grab!